Beaver Lake, August 25th, 2018, Ciel Variable and Killarney, August 11th, 2018, Scattered Showers by Dan Dietzel (20:00 & 10:00 / 2018 / Canada). Two new works by Dan Dietzel explore how to interpret and represent the passage of time in the 21st century. Breathing Through a Straw by Leigh Rivenbark (18:00 / Canada / 2017). When a hookup ends in homicide, Parker decides to confront the man who abused him as a child. How to Stop Watching a Video That Never Ends by Jan Martinec (7:43 / Czechia, China & Taiwan / 2018). An abstract inquiry into the subconsciousness of an individual overloaded with the endless amount of options, possibilities, and opinions of the world of digital media. Platform and Cross Examination by Lori Hiris (2017 & 1994 / USA). Hiris' documentary approach to her work and life is the creative launching pad for her drawings, animations and short films. Tapping Tango by Nancy Snipper (3:11 / Canada / 2018). 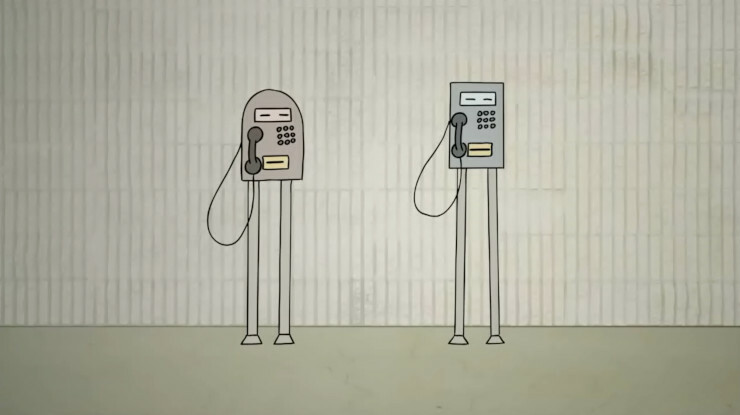 Nancy Snipper's first animated short imagines two pay phones who tap dance and tango their way into love. When I See You by Claudia Carino & James Ramsay (16:20 / Canada / 2018). Tired of putting her girlfriend ahead of her stifled dance career, Kira accepts an opportunity to be a featured dancer in New York City.